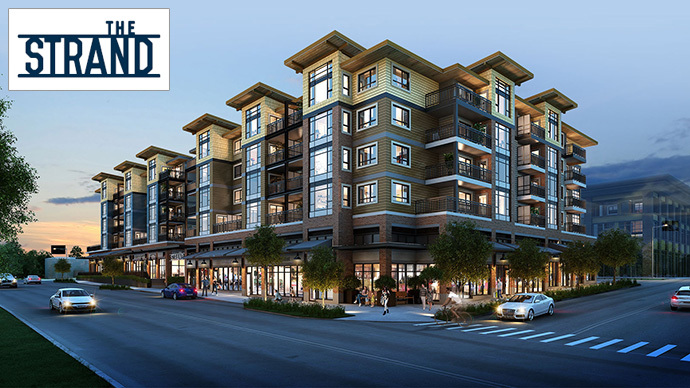 A boutique collection of Oceanfront District Port Moody condos are coming soon to The Strand by Townline. The project will feature well appointed one and two bedroom residences in a location that is rich in heritage, culture and community. There are only 84 opportunities to purchase a brand new Port Moody condo at The Strand by Townline. The beautiful architecture is designed by award winning firm Chris Dikeakos Architects Inc. and the other project team members include TL Housing Solutions (a subsidiary company of the Townline Group) and i3 Design. The Strand Port Moody condos are located in a quiet and safe community within close walking distance to shops, dining, Rocky Point Park, the West Coast Express (to downtown Vancouver) and the upcoming Evergreen SkyTrain Line that connects you to the rest of the Tri-Cities and Lower Mainland. The beautiful homes are designed an outdoor plaza and porte-cochere; very reminiscent of a European open air café. The Strand condos in Port Moody will also feature expansive and oversized windows including outdoor living space that extends your living space outward and affords amazing views of the North Shore Mountains and the Burrard Inlet. The romantic heritage of this historic site is seen through the architectural design, materials and colour palette selected that inspired the turn of the century rail travel of this neighbourhood. There is a welcoming double height lobby with 2 elevators and a residents only exercise room and lounge with large screen television and kitchenette with bar seating and dining table. The lobby enter phone with security camera can be seen on your TV and there is individual out of suite storage for every home and a fully secured underground parking garage. All homes at the Port Moody Strand condos come with the 2/5/10 year home warranty by the Travelers Guarantee Company of Canada. For more information about The Strand Port Moody, please visit the Townline web site at www.townline.ca. The interiors are designed by i3 Design Group and there are two timeless colour palettes for presale homebuyers to choose from. The bedrooms, kitchen, main living space will feature rich wide plank laminate floors and there are oversized painted baseboards, low VOC paints and modern interior doors with contemporary lever-style satin chrome door hardware. Sliding doors will have vertical blinds and windows will have horizontal blinds for privacy. All homes at The Strand Port Moody presale condos will feature stacked 27” EnergyStar washer and dryer as well as thermostat controlled baseboard heating. The main bathrooms and ensuites will feature full height large format matte ceramic wall tile surround with hexagon mosaic accents or stacked tile accents on the plumbing wall. The ensuites have showers with frameless glass enclosure and the main bathrooms have tub and shower combo. 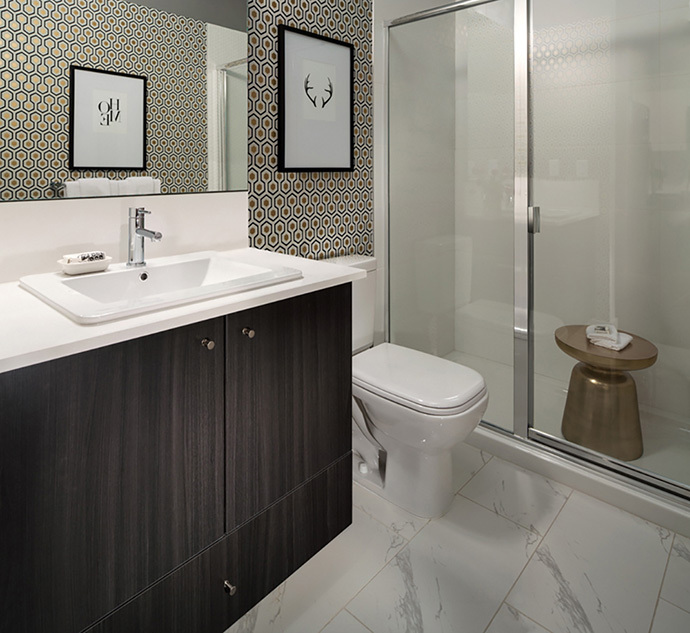 The Strand Port Moody condos will feature large format porcelain tiled floors in the bathrooms as well as solid thick eased square edge quartz stone counters and backsplash with modern rectangular top mounted vanity basin. The cabinetry is square edge flat panel wood laminate with brushed nickel pull hardware. The second bathrooms feature luxury full height large format glossy ceramic tile tub/shower surrounds with horizontal accent strips. Overall, these are fabulously and beautifully designed palettes for your retreat. 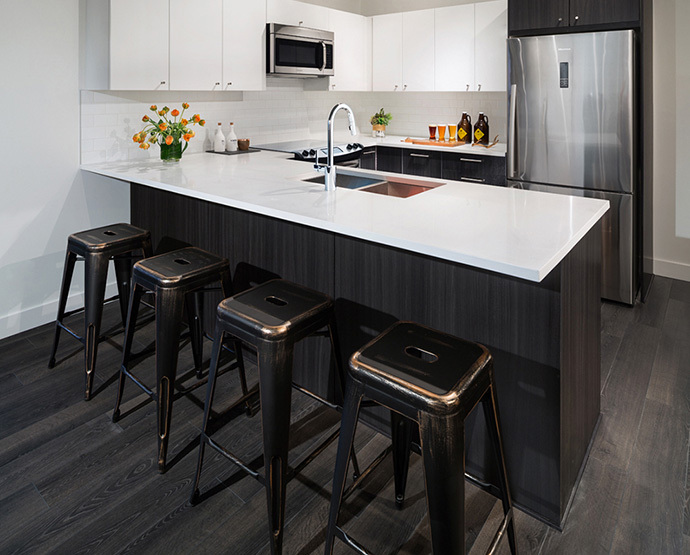 The kitchens at The Strand condos in Port Moody presales real estate market feature square edge flat panel white upper and wood lower laminate cabinetry with brushed nickel pull hardware. As well, homebuyers will find solid thick eased square edge quartz stone counters with glossy subway tile backsplash in a classic brick pattern or modern stacked pattern depending on the colour palette that you choose. There is contemporary track lighting as well as chrome high arc pull down single lever faucet. There is also a designer under mounted contemporary square dual bowl stainless steel sink with radius corners for easy cleaning. The Strand condos in Port Moody will also feature a stainless steel appliance package that includes a Frigidaire 30” microwave hood fan with 2 speeds, Frigidaire Energy Star 24” five cycle dishwasher, Hisense 31” EnergyStar fridge with bottom mount freezer, exterior electronic control, glass shelves and vegetable crisper with humidity control along with a Frigidaire 30” self cleaning electric range with smooth top and ceramic glass cooking surface. There are many flexible floor plans for you to choose from at The Strand condos and the range from 1 to 2 bedroom suites. The largest of the floor plans is Layout Unit Type B which has 2 bedrooms and 2 bathrooms at 900 square feet with a 75 square foot balcony. It’s also a corner unit facing NW and NE. Unit Type D is a 861 sf 2bed/2 bath floor plan that faces SW and SE while Plan F is 859 sf with 2 bedrooms and a workstation. The most intriguing 1 bedroom and 1 bathroom floorplan at The Strand Port Moody is the Unit Type H layout with 1 bed plus workstation at 592 sqft plus 51-61 square feet of exterior area. It faces direct W or E.